Saoirse Ronan stars in actress Greta Gerwig’s directorial debut exploring the senior high school year of a girl living in Sacramento. Lady Bird is without a doubt a sweet and very entertaining coming-of-age film that’s especially impressive for a debut. I’ve always considered Greta Gerwig a great actress, with her touching and quirky performances in Frances Ha and 20th Century Women demonstrating her rare and impressive talent, and here she proves she can create a great story behind the camera as well. Ronan brings out her best performance since Brooklyn as an interesting lead role with a lovable personality. Her character is often self-centered and foolish but her emotion, charisma, aspirations, and love for her family makes her a unique protagonist. The way her relationship with her mother is depicted is very heartwarming and definitely the core of the film, offering another great performance from Laurie Metcalf. The supporting cast including Manchester by the Sea’s Lucas Hedges as one of the protagonist’s boyfriends and Tracy Letts as her father also give it their all and they bring a nice approach that make their characters feel like people involved in this world built around Ronan’s character. The plot and emotions from each character feel very human and aren’t exaggerated too often, and although there are some plenty of hilarious moments, it also known when to be more serious and the comedy and drama elements are balanced really well. Every scene flows from one to the other as if it was real life, and the realistic character personalities, emotions, and actions are reminiscent of films Gerwig has starred in herself. Although it doesn’t have any surprises in the story as it is another coming-of-age film, and some of the events at the end feel a little familiar, but Gerwig brings lots of humor and heart to create an affecting and human story about family, adolescence, and life. 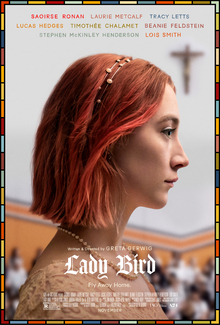 Lady Bird is a great debut from Greta Gerwig with a fantastic performance from the talented Saiorse Ronan. Its mature content makes it one to be viewed by teens and older viewers, but its touching emotion, cast, and writing make it a recommended watch for those who are interested in a grounded and human story that will not fail to entertain you.